On Thursday, December 1, 1955, Rosa Parks made history by refusing to follow Jim Crow laws and give up her seat on a bus. Her act of bravery and activism sparked the civil rights movement. Since then, Rosa Parks has been a pivotal figure in the fight for equality. And right now, more than ever, it is important we remember her and how she stood up for what was right. Read ten things you may not know about Rosa Parks here. Doug Farrand and Margaux Simmons, heads of the music department of the University of Orange, formed Music City, an initiative to unite musicians in the city of Orange on one stage. The city of Orange is rich with diverse musical talent. "A Concert for Peace," being Music City’s inaugural show, was an exciting first step towards a festival in the summer of 2017. 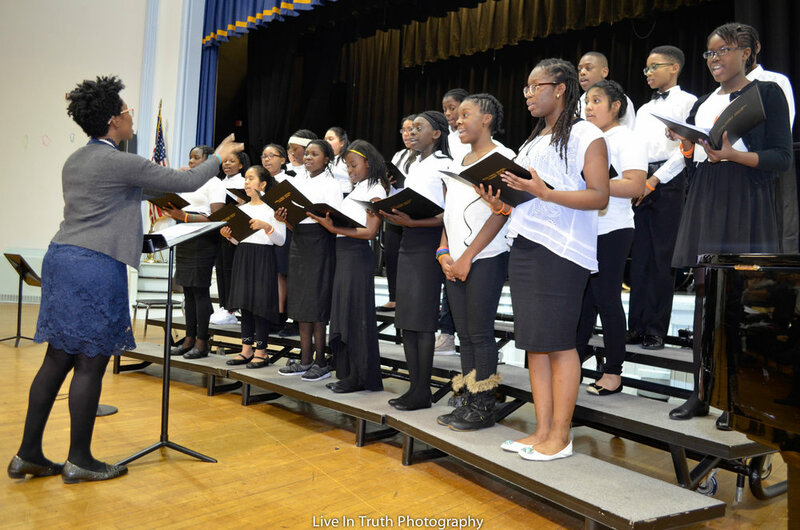 On Thursday, December 1, 2016 at Rosa Parks Community School Auditorium, we gathered for "A Concert for Peace." I attended with Holly Barszcz, also a community fellow at The HUUB. We made it just in time to catch the baritone section of the Orange High School Mighty Marching Tornadoes Marching Band performing three fanfares, leading into a captivating performance of “I Need You to Survive” by the Gospel Chorus of St. Matthew A.M.E Church. "It was beautiful. I loved it. The music and message made me happy. It felt like a church concert. I'm glad I was there. Cute kids singing inspirational songs is a gift I'd offer to anyone." Just like most University of Orange events, I relished in the inter-generational performances on stage. 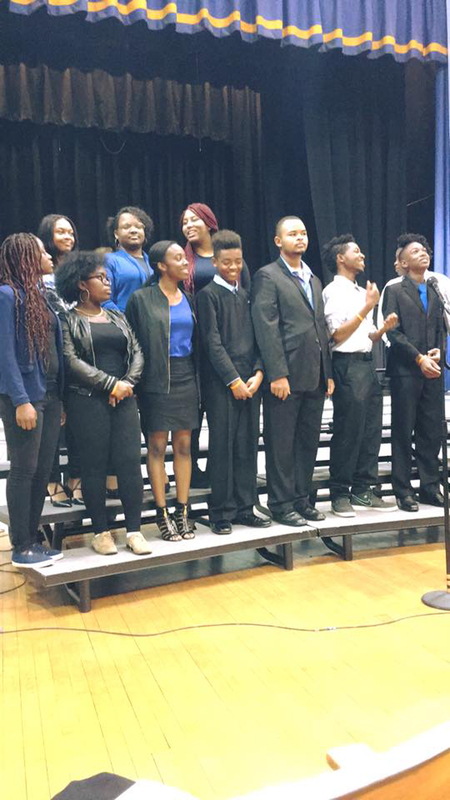 Next was Voices in Harmony of Orange High School led by David Milnes. Their rendition of “Home Foundation” by Up with People was met with a standing ovation. Also, in the U of O tradition, shedding light and in turn educating those in the audience on current events, Margaux Simmons read “Conflict Resolution for Holy Beings (1-3)” after sharing that she had family members protesting on the pipeline. She brought a genuine emotion to Joy Harjo’s words that no one else could. You can read the poem here. 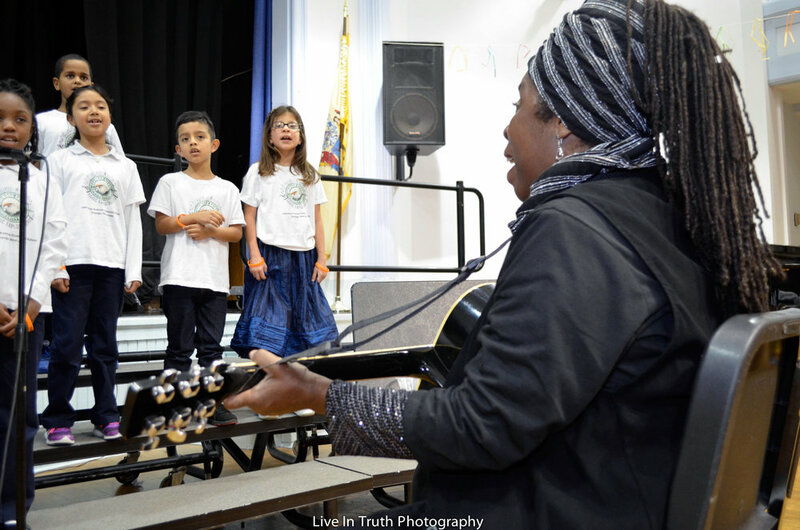 Following Margaux’s poem was the Sonic Explorations chorus of Oakwood Avenue Community School led by long time music educator Queen Mother Imakhu. The group sang “Di-ni Mer ih Shaasha (Give Me Love and Respect),” with Imakhu playing her guitar. 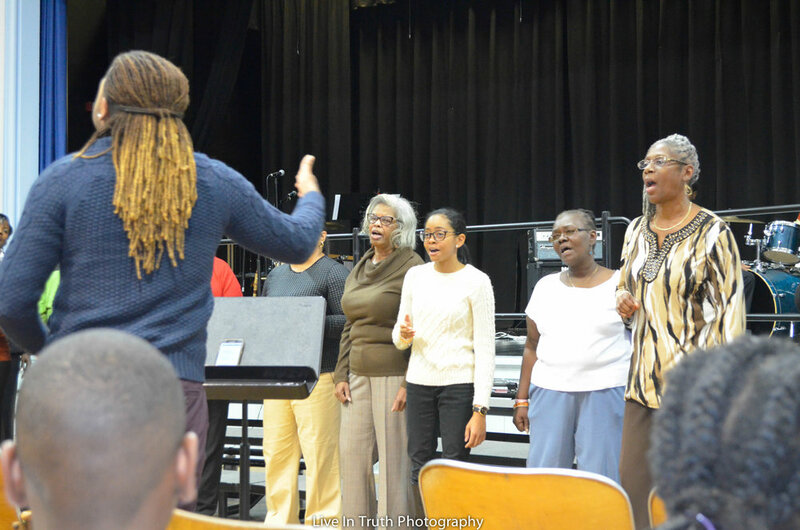 The Sonic Explorations program at Oakwood has been well received, led by Doug Farrand, igniting musical ability and appreciation in people of all ages, not just the students. It has been a great addition to Oakwood Avenue School, and will only get better with more events co-hosted by Music City and Healthy Orange Coalition. Doug Farrand and Margaux then took the stage to give a special message, ss well as present an Honorary Doctorate to Imakhu, who joined the Sonic Explorations teaching time by chance and made a huge impact. 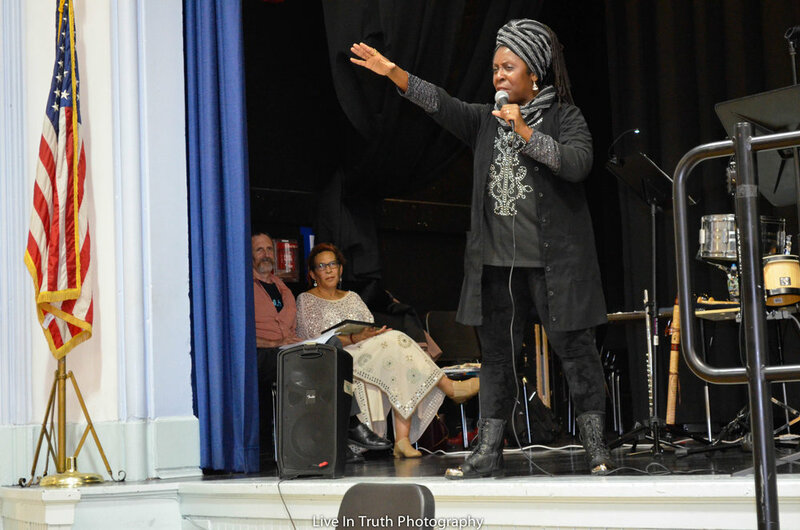 Imakhu then went on to perform African-American folktale, “The People Could Fly,” an inspiring tale from an inspiring woman. I hope to be able to feature her on Masconsumption. Interviewing her would give our readers lots to think about. 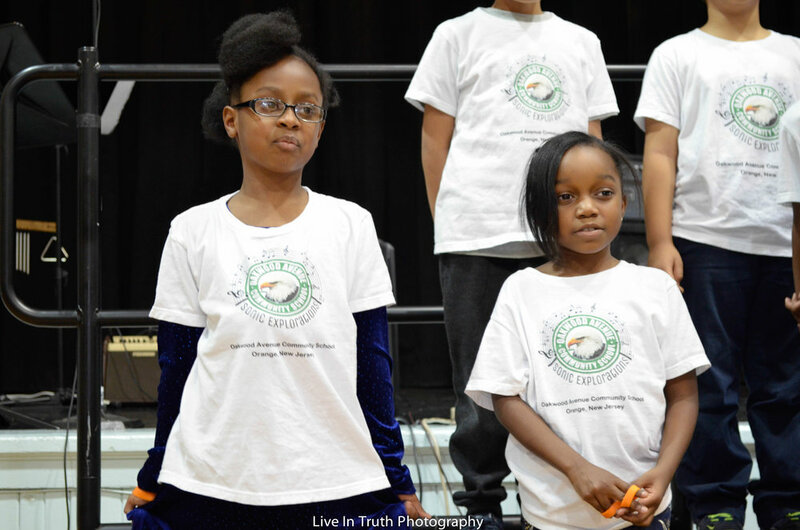 The Rosa Parks Community School Chorus represented with two awesome song selections, “Imagine” by John Lennon and “The Greatest Love of All” by Michael Master and Linda Greed. 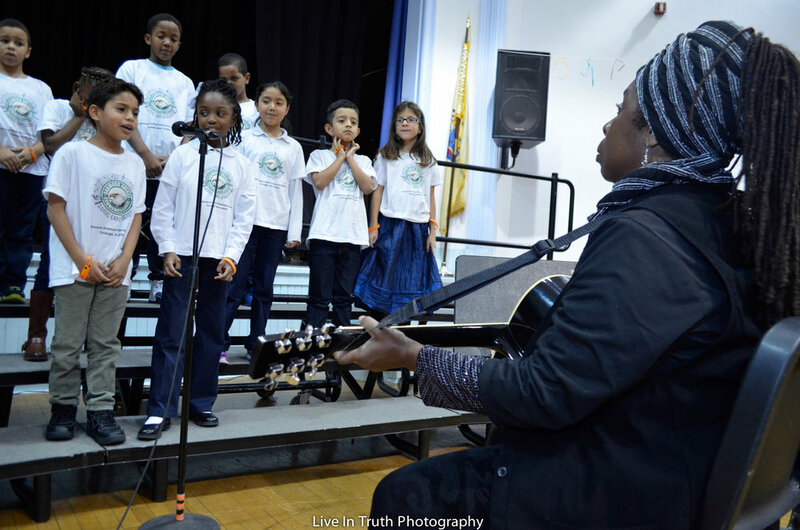 Mariel Johnson, the music teacher at Rosa Parks school, led the group with two powerful solos. This was one of many standing ovations of the night. My good friend and gifted harmonica player, Jamy Lasell, performed “Amazing Grace” after sharing the origin story of a man, John Newton, who worked in the slave trade and was later made a slave. Read the story here. Jamy’s performance was great, as always. I see him perform at Al Gold’s Blues Jam at Hat City Kitchen pretty often. Hearing him play harmonica in the auditorium of Rosa Parks was a treat. The roof was nearly blown off by the next performance. 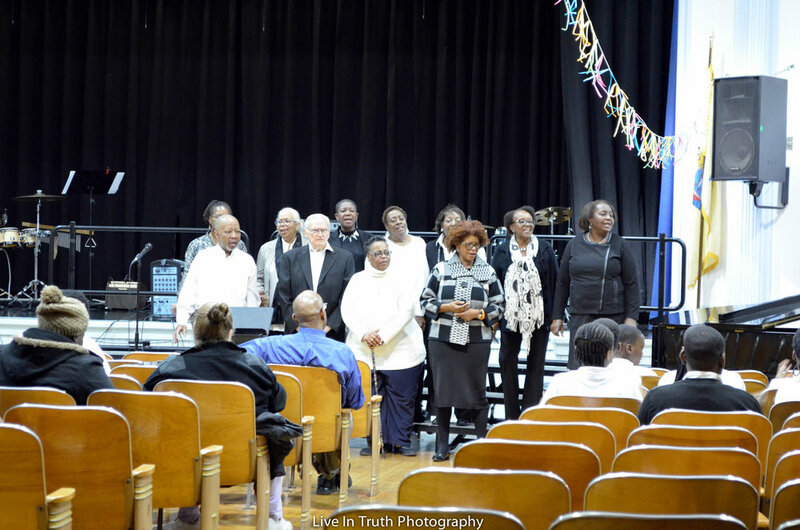 When the Ebenezer Baptist Church Inspirational Choir performed, I was right back in Harlem as a kid in church, mesmerized by the vocals and music. Winston Nelson led the choir in powerful performances of “He Reigns Forever,” “The Sun is Gonna Smile,” and “None But The Righteous.” My hands hurt from clapping along. It was moving, to say the least. Closing the Concert for Peace, Queen Mother Imakhu took the stage and we all joined her for an a cappella version of “This Little Light of Mine.” It was a nice show, and I was glad I was able to attend. Also in attendance were Molly Rose Kaufman, Mindy Fullilove and her family Haruko Takasaki-Fullilove (all the way from Tokyo, Japan), more friends and colleagues, University of Orange’s Aubrey Murdock, Rachel Bland, Bette Bland, Dawan Alford, Khemani Gibson, and I even spotted Chef Jesse Jones. Great job Doug, and thank you to everyone who put in the hard work to put on such a wonderful show.